Bhagavan Sri Krishna is the immortal manifestation of God in all His splendor, that man was ever given the fortune to behold. Man! Blessed thou art, that hast visualised with thy fleshly eyes the mighty Dignity of the Supreme Sovereign of the Universe! Thou art purified; thy birthright is to realise Him; thy fortune is a part of His Greatness! Sri Krishna may be called the "Collective Man", who represented all beings hungering and thirsting to gain the Highest Freedom and who voiced forth their deepest aspirations in the loudest possible tone. He came to release man from the thraldom of vice and correct his vision so that he could walk along the ever-illumined path to perfection. Sri Krishna is the articulation of the pure longings that are buried in the hearts of people. Sri Krishna is not merely a historical man who came and went, like others, but the Eternal Purusha who dwells even now and shall live in the everlasting future, in the core of all manifestation. It is the Symbol of the Absolute descended into relativity that we call Krishna, the ever-beloved protector of all that breathe and air." "Be Content in Whatever Way God Keeps You"
“O man, in whatever state the Lord has placed you, so far as your outer, earthly, secular life is concerned, be content. Be where God has placed you, and be full of inner serenity, be full of inner joy. Never mind what your mind may say. Never mind what people may say. For you know that all comes due to the supreme will of the Almighty, the Universal Being; everything is in His hands. He brings about all things. Knowing this be at rest, be serene, be peaceful. “In all conditions, at all times, amidst all experiences, events and occurrences, in all tests, trials and tribulations, be serene; rejoice in the Lord, knowing that you are safe in His hands. For He, the infinite goodness, infinite love, infinite compassion, infinite justice, infinite wisdom, can never do to you anything that is wrong, harmful or inimical to your highest welfare. Can those having High Blood Pressure practice Asanas? 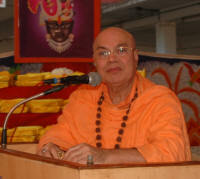 Adhyatma Tour 2017 to USA, Canada & UK (June 27, 2017 - Aug 30, 2017) of Pujya Swami Adhyatmanandaji Maharaj commenced from Chicago on June 27, 2017. It took him to Toronto, Charlotte, Tampa, Atlanta, Houston, Pennsylvania, New Jersey, Toledo (OH), Troy (MI), San Jose area, Madison, Milwaukee & Chicago to continue to UK and HE will be back to the Ashram on Sept 1, 2017. 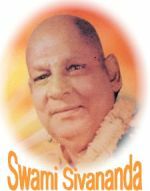 It is all the grace & blessings of Holy Master Sri Swami Sivanandaji Maharaj & Guru Maharaj Sri Swami Chidanandaji Maharaj. Pujya Swamiji's divine satsang and yoga teaching have brought joy, peace & bliss to countless spiritual aspirants and yoga enthusiasts in the West. HE received warm welcome everywhere He went. Here, we share with you the sentiments of love and deepest gratitude expressed by our core organizers group in so many different words. It is overwhelming. "Pujya Swamiji's visit to Charlotte was very short for one day, but his presence in our community is always a long lasting memory. "Chilli", our Kitten sat quietly near Swamiji & had enjoyed the satsang! 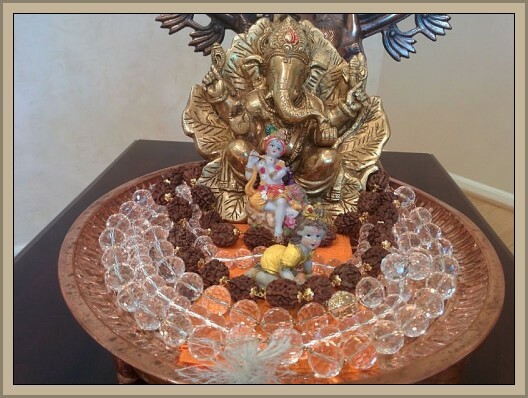 - Sri Bhabani Sarkar (Charlotte, NC)"
A devotee shared a special gift that she received from Pujya Swamiji, a poem composition, "Garland of Mogara (Jasmine) flowers" in response to her flowers offering. Divya Jivan - "Divya Jivan" is a monthly spiritual Journal in Gujarati language from the Sivananda Ashram, Ahmedabad, that has been published regularly over the past fifty years and running. 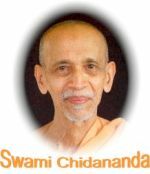 Apart from bringing out various articles of great spiritual imports from various saints of the present and past regardless of their affiliations to organizations, it has also served well to communicate with devotees all over. We request all the Gujarati speaking spiritual aspirants to subscribe to this magazine. August - September 2017 is a combined & special issue containing Life & Teachings of Saints, Sages & Mahatmas.